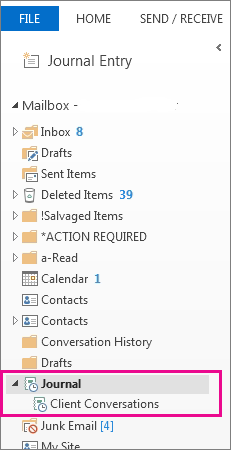 Fewer and fewer people have been using Journal, so we moved it out of the way in Outlook 2013 and Outlook 2016. Here’s where to find it if you’re a Journal fan. You can work with your existing Journal entries or create new ones from the Folder pane. Note: Here’s some more information about discontinued features and modified functionality in Outlook 2013.